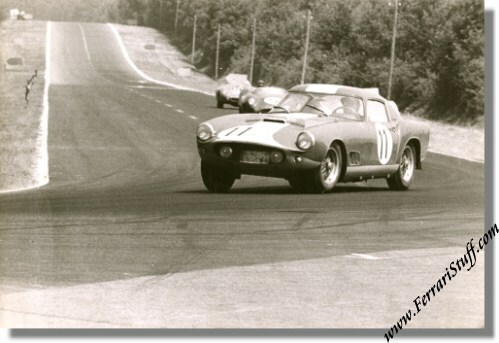 Vintage 1959 photo of Ferrari 250 LWB Berlinetta TdF S/N 1321GT at the Le Mans 24 Hours. This is a vintage 1959 photo of the Garage Francorchamps entered Ferrari 250 TdF of Jean Beurlys & "Elde" during the 1959 running of the 24 Heures du Mans. The duo managed 297 laps which was good for a 1st in class and 3rd overall behind the 2 Aston Martins of Shelby/Salvadori & Trintignant/Frere thus making it the highest placed Ferrari (!). As far as known, this was the car's last racing outing and it now seems to reside in the USA. The photo measures some 29.5 x 20 cm or 12 x 8 inches and is in near mint condition bar (non-sticky!) glue residue on the back. The back carries NO references to the photographer.